Cleaning and Maintaining Your Outdoor Rug! FREE SHIPPING, NO MINIMUM, ALWAYS! Given how great these rugs are to be around, it’s no surprise that they tend to pick up a lot of dirt and grime. This is especially so when they get placed in their natural environment, the outdoors. The best way to keep your outdoor rug looking clean and new is to set some time aside and clean it every month or so, just to keep that pristine look intact. Luckily, cleaning is fairly hassled free! Just mix some dish soap with water and scrub it down for the more problematic areas that may arise, but be sure to clean both sides! Afterward, rinse with a garden hose to wash away all the grit and gunk. Once you’ve washed all the suds and dirt away, set the rug on a rail out in the sunlight for a while so it can dry thoroughly. While they are mold and mildew resistant, if they’re left damp in the shade for extended periods of time then your rug can be at risk, so clean regularly to help to prevent this from happening! 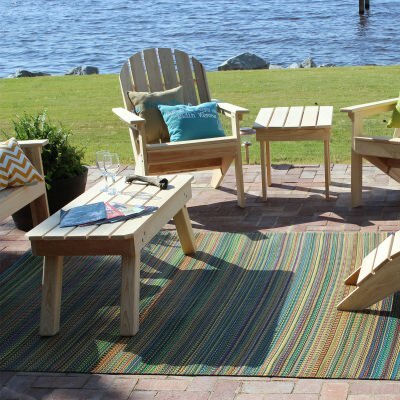 Lastly, to really extend the life of your outdoor rug is to store it when it isn’t in use. This can prevent unnecessary wear on the synthetic fibers of your rug. Also, when it’s stored you don’t have to worry about cleaning it or maintaining as long as it is rolled up in a dry location. You can also learn more about caring and maintenance for our other products at our Knowledge Center!